General anesthesia is sometimes described as a "controlled coma", in which the anesthesiologist induces a temporary loss of consciousness on the part of the patient, and then restores it again after the surgery is over. But what about uncontrolled coma -- the sometimes permanent loss of consciousness that occurs in cases of severe brain injury? The principal problem in developing a scientific approach to consciousness is simply this: How can we make an objective study of subjective mental states? How can we gain public access to something that is essentially private? As we saw in the lectures on Introspection and Psychophysics, the 19th-century psychophysicists addressed this problem by tying subjective reports of sensory experience to the objectively measurable physical properties of the stimulus environment. And the 19th-century physiological psychologists, for their part, tied subjective reports of sensation and perception to measurable aspects of sensory physiology. This was also the tack taken in the 20th century by those who tried to identify the Neural Correlates of Consciousness. In either case, the method is to establish links between self-reports of conscious experience and objectively measurable physical or physiological indices. And it works -- so long as we're willing to take people's self-reports of their conscious states seriously as criteria. Without that willingness, there's no point in even doing the study. It's hard enough to study conscious mental states scientifically, but this fundamental problem is compounded when we try to study peoples unconscious mental states. How do we establish the existence of percepts, memories, and the like of which subjects are not consciously aware, and about which they cannot introspect and report? Solutions to this problem were discussed in the lectures on "Attention and Automaticity" and "The Explicit and the Implicit". The "Four Horsemen of Automaticity": inevitable evocation, incorrigible completion, efficient execution, and parallel processing. Methods like Jacoby's Process-Dissociation Procedure and Sherman's QUAD Model. We can observe dissociations between explicit (conscious) and implicit (unconscious) memory in amnesic patients and even neurologically intact subjects. And extend the dissociation paradigm to other domains, such as perception, learning, memory, motivation, and emotion. We confront a similar problem when we turn to the topic of "altered" or "special" states of consciousness, where subjects report that their state of consciousness differs markedly, in at least some respects, from "normal". How can we study altered states of consciousness objectively? Well, by exactly the same means. In a paper whose publication marked the beginnings of the "consciousness revolution" in cognitive psychology and cognitive science, Johann Stoyva and Joe Kamiya (1966) proposed that converging operations be used to identify and study various altered states of consciousness (ASCs). An ASC was not identified with any one of these, but the "diagnosis" of an ASC could be made with increasing confidence, depending on converging evidence from many different measures. Induction procedure: An ASC is induced in a subject by means of a specific procedure. "Psychedelic" states are induced by ingesting a drug like LSD or cannabis. Hypnosis is typically induced by giving a subject suggestions for relaxation, focused attention, and eye closure. Self-Reports: Subjects report that some aspect of their phenomenal experience has changed markedly. A person who has ingested LSD reports various hallucinatory perceptual experiences. A hypnotized subject says he feels like he's 5 years old again. Overt Behavior: Subjects engage in overt, publicly observable activities that are commensurate with their reported mental state. A sleeping subject lies prone and motionless on a bed. An age-regressed subject prints his name in a childlike manner. Physiological Response: subjects manifest some change in covert, physiological activity. A subject who hallucinates a snake on a nearby table shows heart-rate acceleration indicative of fear or anxiety. The logic of converging operations spells out, in formal detail, what has been implied all along: if the study of consciousness is to be put on a firm scientific basis, introspective self-reports of phenomenal experience should be corroborated by objective evidence of stimulus conditions (induction procedure), overt behavior, or neural or other physiological correlates. Stoyva and Kamiya's proposal was based on earlier theoretical work in perception, which confronts a problem similar to our problem: when considering subjects' reports of perceptual experience, how can we be sure that these reports are accurate? Garner, Hake, & Eriksen (1956) proposed that alternative explanations of subjects' perceptual self-reports could be ruled out by successive experiments. Therefore, the evidence for a particular perceptual effect did not depend on a particular measure, but rather by the convergence among several different measures. The problem is even greater when we try to understand perception in infants and other pre-verbal children, or in animals, who can't talk to us at all. Proffitt and Bertenthal (1990) discussed the application of converging operations in the study of infant perception. Correlations across methods within a trait should be higher than correlations across methods between traits. This is known as trait variance. That is to say, the correlation between self-report and behavioral measures of extraversion should be greater than the correlation of either of these variables with self-report or behavioral measures of neuroticism. There may also be correlations between different traits measured by the same method. This is known as method variance. That is to say, the correlation between self-report measures of extraversion and neuroticism may also be significant, because of something (like a tendency to respond in a socially desirable way) that both measures share in common. If a trait is a valid construct, trait variance -- variance common to different measures of the same trait -- should be greater than method variance -- variance common to similar measures of different traits. There are lots of different ways to get into a coma, but most involve some sort of traumatic brain injury (TBI), such as a gunshot wound to the head or a closed head injury (in which there is brain damage, but no external loss of blood). Concussion is defined as a temporary disturbance of consciousness resulting from a closed head injury. Loss of consciousness lasting more than 5 minutes. Post-traumatic amnesia lasting more than 12 hours following the injury. This may be anterograde amnesia, covering events occurring after the TBI. Or it may be retrograde amnesia, covering events leading up to the TBI. In addition, concussion victims may show secondary symptoms such as easy fatigability, sleep disorder, headache, vertigo, or dizziness. Grade 1: No loss of consciousness, but transient confusion and other symptoms lasting less than 15 minutes. Grade 2: No loss of consciousness, but transient confusion and other symptoms lasting more than 15 minutes. Grade 3: Any loss of consciousness, whether brief or prolonged. In mild concussion, consciousness is only impaired, as in the "ding" all-too-commonly experienced by football players. In a provocative study, Yarnell and Lynch (1973) studied college football players who suffered either concussion or broken limbs over the course of 18 games. As soon as possible after the injury, these investigators presented the players with a series of informal tests. For example, they were asked if they remembered receiving a medical examination on the field; if they remembered their injury, and what play was in progress. Although all of the concussed players were disoriented immediately after their injury, none of the players actually lost consciousness. Nevertheless, they lost conscious recollection within minutes of their injury -- sometimes with a lucid interval, in which they could remember, before the amnesia set in. There is no communication with the patient. The patient is unresponsive to auditory, visual, or tactile stimulation, although the patient may generate certain somatosensory reflexes. In particular, there is no startle reflex to surprising stimuli. The patient displays no signs of emotion. The patient's eyes are closed, and there are no indications of the normal sleep-wake cycle. Stupor is a state of suppressed consciousness in which only very vigorous stimulation elicits a response from the patient. The GCS is very popular, but it has some problems -- mainly, that it requires an assessment of a verbal response, when many brain-injured patients have been intubated, and thus cannot speak. Accordingly, a group of neurologists at the Mayo Clinic have proposed a new scale, known as the FOUR score -- for Full Outline of UnResponsiveness (Wijdicks et al., 2005). 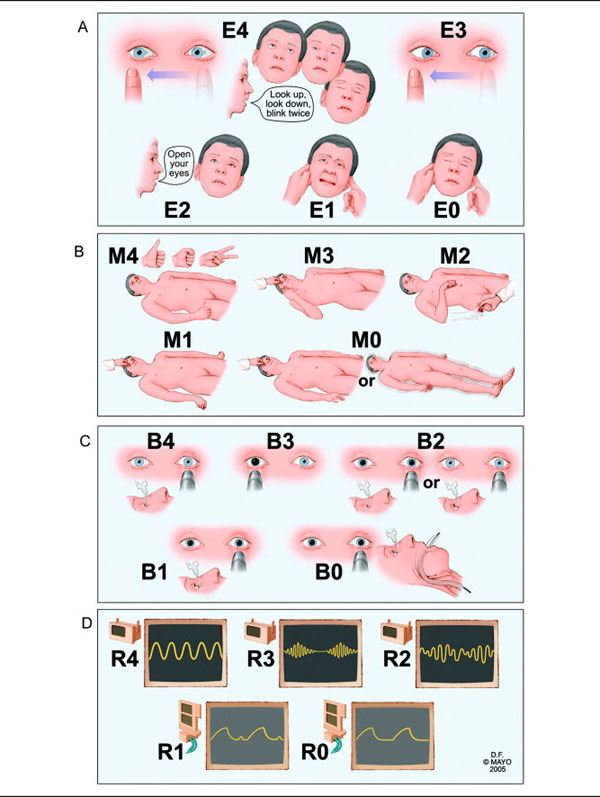 The FOUR score assesses eye and motor responses, much as the GCS does; but instead of a verbal response, it assesses respiration and brainstem reflexes. The FOUR scale can be administered to nonverbal patients, and it also appears to make finer distinctions among patients with the lowest scores on the GCS. There is still no communication with the patient. The patient may show partial response to stimulation, typically in the form of auditory and visual startle reflexes. Occasionally, the patient will orient to the stimulus as well. The patient may also show withdrawal from a noxious somatosensory stimulus. The patient shows few signs of emotion; sometimes there is reflexive crying or smiling. The patient's eyes will open, and shows normal sleep-wake cycles, as indicated by a periodic closing of the eyes, and then re-opening. PVS patients sleep during the day, too, whereas control subjects sleep only at night, showing the typical diurnal sleep cycle. Of course, the control subjects were ambulatory, and it's not clear what non-PVS patients who were confined to their beds for 24/7 would do. But my guess is that they'd sleep at least for some time during the day as well as the night. It seems clear that comatose patients do not go through anything like REM sleep. Their EEGs are dominated by delta and theta activity, but this is not the same thing as SWS. Rather, it appears to represent a disruption of the brain's arousal system. Vegetative patients, by contrast, do show periods of REM activity, although the sheer amount of REM activity is reduced. They actually spend more time in REM sleep than controls do -- though, remember, the patients also sleep during the day. Looking just at nocturnal sleep, PVS patients have fewer REM periods than controls, less total REM time, and shorter REM periods. However, the absence of REM activity has been reported in some vegetative patients. This suggests that the diagnosis of PVS vs. coma could be improved by the use of polysomnography to actually document sleep activity in these patients -- as opposed to a reliance on behavioral signs such as the periodic closing and opening of the eyes. Patients who cycle between REM and SWS would be diagnosed as vegetative; those who do not would be diagnosed as comatose. This is especially the case if, as appears to be the case from the limited evidence, signs of normal sleep patterns appear to be associated with better prognosis for recovery. For more details about polysomnography, see the lecture supplements on Sleep and Dreams. PVS was first described by Jennett and Plum in 1972. In 2005, it was estimated that there were approximately 10-15,000 patients diagnosed with PVS in the United States. 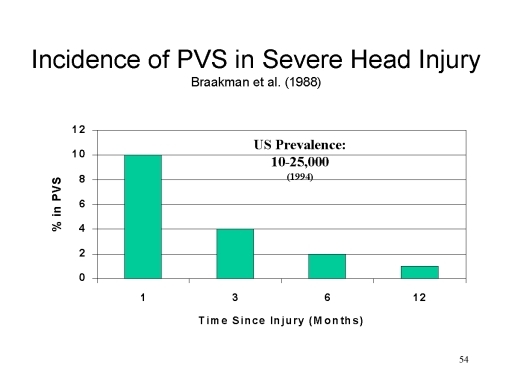 PVS is relatively rare in absolute terms, and is most likely to occur within 1 month of the patient's head injury. 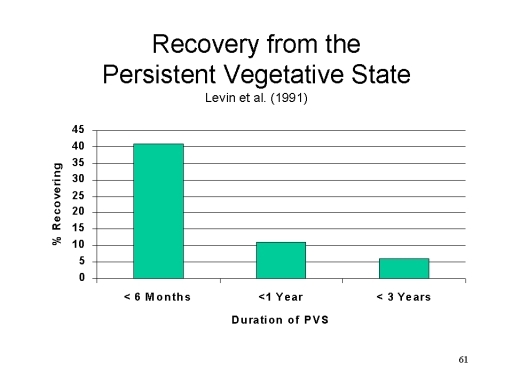 Recovery from the PVS is most likely to occur within 6 months of onset, and PVS patients almost never recover after three months --at which time the vegetative state can truly be called persistent. In 1994, a review of over 700 cases of PVS revealed not a single instance of recovery after two years in the state. Still, recoveries are possible even after moderately prolonged periods of time. In 2002, a woman in Tustin, California fell into a coma one day after giving birth, and 10 minutes following surgery for a brain tumor. After one year, she opened her eyes, turned toward her mother, and smiled. Now she is able to lift her arms and hold her child. However, she cannot smile, walk, or talk -- instead, she communicates by rolling her eyes (West County Times, 04/07/03). 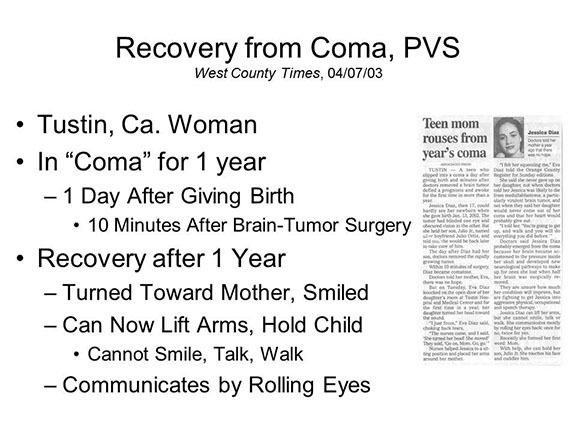 But anecdotal reports of "miracle recoveries", after years in coma or PVS, are largely unverified. Note: A student pointed out an apparent contradiction in this case report: at the time of recovery, the patient smiled at her mother; but on later examination, she could neither smile nor talk. Here's my interpretation: the family was at the patient's bedside when the recovery occurred. There's no doubt that she turned her head, or made some other noticeable movement; but her expression may have been ambiguous, or even an involuntary facial expression, which was interpreted by her mother as a smile. Later careful testing, under more controlled conditions with more objective observers, did not confirm the patient's ability to smile voluntarily. But the recovery itself was obvious by the patient's ability to interact with her child and communicate via eye movements. The patient's communication is inconsistent but intelligible. There may be some vocalization contingent on environmental stimuli, as well as occasional verbalization and gesture. The patient responds partially to environmental stimulation. There is some degree of auditory localization, and inconsistent following of commands. Occasionally, there will be sustained visual fixation, as well as sustained pursuit of a moving target. The patient will occasionally localize noxious stimuli, making "automatic" movements in response to them; when the patient reaches for objects, he or she may accommodate his hands and fingers to their shape. The patient can cry or smile contingent on environmental events. PVS was first described by Giacino and Schiff in 2002. In 2005, it was estimated that there may have been as many as 100,000 patients with MCS in the United States -- some misdiagnosed as in coma or PVS. It seems that recovery from coma progresses through PVS to MCS, and -- if the patient is lucky -- to the recovery of fuller consciousness. In 2004, the American public (and, indeed, people throughout the world) was riveted by the story of Terri Schiavo (pronounced SHY-vo), who lapsed into a persistent vegetative state on February 25, 1990, at age 26, following heart failure possibly caused by a potassium imbalance. Thereafter she was kept alive by means of a feeding tube. In May 1998, her husband Michael petitioned to remove her feeding tube, saying that Ms. Schiavo had expressed her wish not to be kept alive artificially. Unfortunately, Ms. Schiavo never expressed this wish in writing. In 2001, the feeding tube was actually removed pursuant to a ruling by state circuit court judge George W. Greer. At this point, Ms. Schiavo's parents, Robert and Mary Schindler, filed a counter-suit which resulted in the restoration of the feeding tube. In 2002, an MRI brain scan revealed almost total atrophy of the cerebral cortex, and an EEG showed the absence of any measurable brain activity. Judge Greer ruled that Ms. Schiavo no longer had any likelihood of recovery, ordered the feeding tube removed. Again the parents counter sued, but in 2003 a state appeals court refused to reverse the lower court's ruling. When the tube was removed again, the Florida state legislature passed a bill allowing Governor Jeb Bush to intervene in the case (see "It May Be a Family Matter, but Just Try to Define Family" by Shaila K. Dewan, and "'My Father Wasn't There'" by Dudley Clendinen, New York Times, 10/26/03). On October 21, Bush signed "Terri's Law" and ordered the tube reinstated. In September 2004, the Florida Supreme Court declared "Terri's Law" an unconstitutional encroachment on the judiciary, and in February 2005, following another round of appeals, the original state circuit court judge ordered the tube removed once again. After another round of appeals, Ms. Schiavo's feeding tube was removed on Friday, March 18. Although Ms. Schiavo did not express her wishes in writing, polling data taken as events unfolded indicated that some 75% of Americans did not wish to be preserved, on life supports, indefinitely in a coma or persistent vegetative state. So, while her apparent wishes were open to legitimate debate, they were hardly unusual; in fact, they were normative, shared by far more than half the population. The Schiavo case had an important precedent in the case of Karen Ann Quinlan, who lapsed into a vegetative state in the 1970s. Following a medical judgment that she had no prospects of recovery, her parents asked that she be disconnected from her respirator and allowed to die "with grace and dignity". The hospital initially refused to do so, but in 1976 the New Jersey Supreme Court ruled unanimously in the parents' favor. Quinlan actually lived for nine more years, receiving feeding and medication, until she died of pneumonia in 1985. Even so, the Quinlan case gave rise to the "right-to-die" movement in the United States, and the Death with Dignity" act passed by Oregon in 1997 and since upheld by the United States Supreme Court. Up until this point, this had been a matter only between husband and parents, and confined to the State of Florida. Now, however, aided by a number of socially conservative, right-to-life, and disability-rights advocacy groups, including an alliance between Roman Catholics and evangelical Protestants, the United States Congress got into the act. The extraordinary drama that played out, even more extraordinarily, over the course of the Christian Holy Week, between Palm Sunday and Easter -- in what one supporter of the Schindlers pointedly called "the passion of Terri" ("Supreme Court Refuses to Hear the Schiavo Case" by Abby Goodnough, New York Times, 03/25/05). In a weekend session, both the Senate and the House of Representatives approved a bill, essentially a piece of "private relief" legislation, that would require federal courts to determine whether the state courts had provided Ms. Schiavo with due process (by this time, the case had already been reviewed at the state level approximately a dozen times). In debating the legislation, the Senate Majority Leader, Bill Frist (R. Tennessee), a heart surgeon, offered the opinion, based on a viewing of selected excerpts of a videotape provided by the Schindlers, that Ms. Schiavo was "not vegetative". Among the most vigorous supporters of the legislation was the House Majority Leader, Tom DeLay (R-Texas). Interestingly, DeLay himself had previously chosen to have life supports removed from his own father, who had suffered irreversible brain damage in an accident. And, for that matter, Robert Schindler, Ms. Schiavo's father, had withdrawn life supports from his mother. Following extraordinary Sunday sessions of both houses of Congress, in which legislators had to be called back to Washington from their spring recess, the bill was passed shortly after midnight on Monday, March 21. President George W. Bush, brother of the governor, flew back to the White House from vacation in Crawford, Texas so that he could be awakened at 1:00 AM to sign the bill. After a hearing later that day, Federal Circuit Court Judge James D. Wittemore issued a ruling at dawn on Tuesday, March 22, that due process had already been given in the case, and declining to order the feeding tube reinstated. His ruling was subsequently upheld by a three-judge panel of the 11th Circuit Court of Appeals (voting 2 to 1), the full 12-judge appellate court (voting 10-2), and the United States Supreme Court (which declined to hear the case) -- all within the short span of two days. "Although Terri did not demonstrate during our 90-minute visit compelling evidence of verbalization, conscious awareness or volitional behavior, yet the visitor has the distinct sense of the presence of a living human being who seems at some level to be aware of some things around her." This petition also went to Judge Greer, who on Thursday -- the same day that the Supreme Court declined to take up the case -- ruled against the Governor and also barred state officials from taking Ms. Schiavo into "protective custody" for purposes of reinstating the feeding tube. Before Easter, the Schindlers asked their supporters to go home, and the weekend passed quietly outside the Woodside Hospice where Ms. Schiavo was receiving end-of-life care. Also providing deep background for this saga was the controversy over Million-Dollar Baby, the Academy-Award-winning film directed by Clint Eastwood (2004), whose plot features a decision whether to end the life of a person who, though fully conscious, has been rendered quadriplegic by an accident. After Easter, Jesse Jackson, the prominent civil rights leader, entered the fray on the side of the Schindlers, calling the treatment of Ms. Schiavo "inhumane" and calling once again on the Florida state legislature to pass legislation forcing the hospice to restore her feeding tube. The parents once more petitioned the federal court to intervene in the case, and some advocacy groups continued to pressure Governor Bush to intervene -- using the State Police or even the National Guard if necessary. Whereas other court petitions had been based on procedural grounds, like denial of due process, this new petition asked the court to consider new factual evidence -- presumably evidence about whether Ms. Schiavo was properly diagnosed in PVS as opposed to MCS. On Wednesday, March 30, the 11th Circuit declined to hear the case -- in a one-sentence ruling that was accompanied by a bitter concurring opinion, by Judge Stanley Birch, a conservative Republican appointee of President George H.W. Bush, that criticized Congress and President George W. Bush for intervening in a state matter, and suggesting that the legislation passed and signed over Palm Sunday weekend was an unconstitutional infringement on the judiciary ("Federal Judge Condemns Intervention in Schiavo Case" by Abby Goodnough & William Yardley, New York Times, 03/31/05). And again, the Supreme Court declined an appeal (the constitutionality of the law will probably never be tested before the Supreme Court, because it only applies to Ms. Schiavo, and will expire with her death). Ms. Schiavo died on Thursday, March 31, 2005. An autopsy revealed massive brain damage, including the cerebral cortex, subcortical structures such as the thalamus and hippocampus, midbrain, and cerebellum. A somewhat similar scenario has played out in the case of Jahi McMath, a 13-yer old girl who, in 2013, underwent surgery at UCSF Children's Hospital for the removal of her tonsils and other tissue from her nose and throat. She went into cardiac arrest and was declared brain dead, but her family refused to allow the removal of life supports. She was subsequently moved to a hospice facility in New Jersey (which allows families to reject determinations of brain death on religious grounds). In October 2014, her family petitioned to have her death certificate voided on the ground that she was not brain-dead after all. Her family's attorneys claimed that a structural MRI had shown that her brain was intact and receiving blood flow. More important, they presented video evidence purporting to show that, on at least two occasions, Jahi had moved her limbs in response to commands. In their petition, the family's attorneys did not claim that Jahi was in a persistent vegetative state. They simply argued that she was not brain-dead. On the other side, other experts have noted that brain-dead individuals can sometimes show spasmodic movements that can be mistaken for voluntary motor activity. For a journalistic account of the Jahi McMath case, see "The Death Debate" by Rachel Aviv, New Yorker, 02/05/2018. There are a number of salient issues raised by these cases. Another is the moral, religious, and legal argument about the right to life. While patients have an absolute legal right to refuse treatment, and effectively end their lives, in this case there is no written directive from Ms. Schiavo herself -- only the testimony of her husband (who in 2005 was engaged to be married to another woman, by whom he had already had two children) -- and her parents and siblings, devout Catholics, who fervently believe that she would never give up her right to life. Then there is the issue about the proper clinical diagnosis. She is not in a coma. Most authorities, including Dr. Ronald Cranford, the neurologist who examined Ms. Schiavo for Judge Greer in 2002, have argued that she is in PVS. At that time, a CT scan of her brain revealed "very little but scar tissue and spinal fluid. An electroencephalogram measuring electrical activity in the thinking portions of her brain showed no evidence of continued function.... 'It's totally flat -- nothing,' Dr. Cranford said, 'and this is very unusual. The vast majority of people in a persistent vegetative state show about 5 percent of normal brain activity'" ("Schiavo's Condition Holds Little Chance of Recovery", by Benedict Carey & John Schwartz, New York Times, 03/26/05). The clinical debate is over whether Ms. Schiavo is in PVS or MCS, and most neurologists who have testified before the state court have opted for a diagnosis of PVS. The diagnosis of MCS, or at least "not PVS" seems to be based on occasional episodes in which Ms. Schiavo responds to stimulation. But these episodes are very infrequent, and may reflect nothing more than spared reflex activity. Even so, current diagnostic standards do not permit MCS to be diagnosed more than 3 months after brain damage of the sort suffered by Ms. Schiavo. A related question is whether withholding hydration and nutrition, with the goal of ending life, evokes suffering. While starvation would cause a conscious person to suffer, again the assumption is that Ms. Schiavo is not, in fact, conscious. Under that assumption, terms like "starvation" "hunger", and even "feeding" begin to lose meaning (although we do speak of "feeding" plants). In the context of PVS, the American Academy of Neurology states that the provision of fluids and nutrition (note the avoidance of the term "feeding") should be considered to be a medical procedure "analogous to other forms of life-sustaining treatment, such as the use of a respirator" -- and thus, in the end, a medical procedure that is optional. So, in the final analysis, all the medical questions hinge on whether Ms. Schiavo is, in fact, conscious to any degree. It would be nice to think that formal neurological and neuroscientific testing would have helped resolve this issue. In fact, previous testing had indicated that Ms. Schiavo's EEG record was flat, indicating no cortical activity, and a CT scan indicated that about 95% of her brain tissue had been replaced by fluid. There are standards for distinguishing between PVS and MCS, based mostly on careful observations of the patient's response to environmental stimuli; in principle, these could be developed into formal laboratory tests of the sort used to diagnose other forms of medical illness. But note that MCS was only described for the first time in 2002. Before that, the only diagnostic choice was PVS. Nevertheless, none of these formal tests had been performed during the later stages of the case. Perhaps the court should have ordered a new round of testing, conducted by an impartial expert, to determine the proper diagnosis. But it is not clear that even confirmation of MCS, as opposed to PVS, would have changed the legal situation -- because the essence of Mr. Schiavo's argument is that Ms. Schiavo had expressed a desire not to be kept alive artificially -- presumably, even if she were in fact fully conscious. A New York Times commentary on the Schiavo case was headlined, "Did Descartes Doom Terri Schiavo?" (article by John Leland, 03/27/05). The writer argued that while Aristotle had held that "existence itself to be inviolable", Descartes "defined human life not as biological existence -- which might be an inviolable gift from God -- but as consciousness, about which people can make judgments." But it doesn't seem that the Schiavo case is really about whether some lives are worth living, or whether the value of a human life can be quantified. To be sure, there is a legitimate debate about Ms. Schiavo's true wishes -- but legally, patients have a right -- affirmed in a Supreme Court decision -- to make this decision for themselves, and to refuse treatment, and even Catholic doctrine permits them to do so. Rather, the question in this case is whether Ms. Schiavo, lacking a brain, lacks consciousness as well; and so it hinges on questions about how much brain she has, and how much brain is required for consciousness. In fact, the Cartesian perspective seems to cut both ways. True, Descartes argues that consciousness is a uniquely human characteristic; without consciousness, a human being is just another animal -- an animal that does not, in Descartes' view, experience pain, and which presumably may be deprived of life at will. But on the other hand, consciousness for Descartes is not just about the mind. For Descartes as a devout Catholic, consciousness was the mark of a person's immortal soul. And for Descartes as a substance dualist, the soul/mind was immaterial, not part of the body, and survived the body after death. In the final analysis, for Descartes, it doesn't matter whether a person has a functioning brain, because the brain has nothing to do with either soul or mind. In a commentary written and published before Ms. Schiavo's death, Hendrik Hertzberg wrote, "The body lived; the mind died.... Terri Schiavo's life, as distinct from the life of her unsentient organs, ended fifteen years ago". Nevertheless, he continued, "On a human level, it was hard to see what concrete harm there could be in indulging her family's wish to keep her body alive, its care presumably underwritten by the hospice and the family's supporters" ("Matters of Life", New Yorker, 04/04/05). Here again, we see how the argument about mind and body cuts both ways. If Ms. Schiavo no longer had a mind, because she no longer had a brain, then it is possible to argue that her husband, or her parents, could do what he, or they, wanted with her body. But that doesn't seem right either. Do we really want cases like this to degenerate into a battle over custody -- that is, in essence, a battle over property rights? But time and again, the courts determined that her own wishes, expressed when she had a brain, and thus a mind, controlled the disposition of the case. If only she had expressed them in writing, in front of witnesses. Then she (or, at least, her memory), and they, and us, would have been spared the spectacle. Actually, history repeated itself in 2009, with Eluana Englaro, an Italian woman who had been in a persistent vegetative state since 1992. Her father, Beppino Englaro, had petitioned to remove her feeding tube, reflecting what he said was her frequently expressed wish before she was injured in an automobile accident. Despite the opposition of the Catholic Church, several court decisions, including one by the Constitutional Court, had allowed the feeding tube to be removed. At the last minute, the conservative government of Prime Minister Silvio Berlusconi issued an emergency decree to prevent the removal, but President Giorgio Napolitano refused to sign it, instigating a constitutional crisis. Berlusconi, in turn, drafted a bill for the Italian Parliament, where his coalition has a substantial majority. The feeding tube was removed, and Ms. Englaro died on February 9, 2009, before Parliament could take action ("Italy Moves to Keep Alive a Woman in a Coma" by Rachel Donadio, New York Times, 02/07/2009). Coma and PVS are to be contrasted with the "locked in" syndrome, where the person is fully conscious but cannot communicate beyond eye signals. Locked-in syndrome was made famous by Awakenings, an early book about Parkinson's disease by Oliver Sacks, subsequently made into a film starring Robin Williams (who captured Sacks' demeanor perfectly). And also by The Diving Bell and the Butterfly, a book (and subsequent movie) by Jean-Dominique Bauby, former editor of a French fashion magazine, recounting his own experience of locked-in syndrome, following a massive stroke at age 42. "Locked-in" patients show anarthria (loss of articulate speech) and aphonia (loss of vocalization). They are quadriplegic, lacking voluntary motor function in all four limbs. Auditory and visual functions are preserved, in terms of startle and orienting responses; also localization, fixation, and pursuit functions are intact. Communication is preserved -- not vocally, or by means of gesture, but in terms of blinking and vertical eye movements. "Locked-in" patients have severe motor difficulties, which is why they're called "locked-in". But by every standard they are consciously aware of both the external environment and their internal states. Coma is primarily associated with damage either to the posterior portion of the upper brain stem -- the area known as the reticular formation (including the periaqueductal gray and the parabrachial nucleus), which serves to maintain general levels of cortical arousal and alertness. At first thought, it would seem that stupor, PVS, and MCS are associated with damage to these same areas, though presumably less severe than in the case of coma. Actually, PVS is commonly associated with damage to the thalamus, as opposed to the brainstem. The thalamic damage impairs awareness, while the spared brainstem continues to generate the sleep-wake cycle. Because the thalamus serves as a general sensory relay center, presumably the thalamic damage prevents incoming sensory impulses from being processed by the cortex. PVS is more common following anoxia, which affects the brain as a whole, than following a traumatic head injury, whose affects may be more localized. The pattern of brain damage in the "locked-in" syndrome differs from that observed in coma. Here the damage is in the pons and upper anterior portion of the brain stem, and excludes the reticular formation. Because the reticular formation and thalamus are both spared, consciousness and the sleep-wake cycle are also spared. So exactly how do locked-in patients get locked in? Most of the efferent pathways that connect the brain to the cranial and spinal nerves pass through the pons. So, if the pons is destroyed, efferent signals can't get where they're supposed to go, and the person is effectively paralyzed. But, it turns out that the damage to the pons is confined to areas below where the trigeminal nerve (V cranial nerve) enters the brainstem. As a result, the oculomotor nerve (cranial nerve III) and the trochlear nerve (cranial nerve IV) nerves are unaffected, sparing voluntary movements of the eyes and eyelids. It was by this means that Jean-Dominique Bauby was able to write The Diving Bell and the Butterfly. Because his right eye had been sewn shut to prevent infection, he "dictated", spelling out each letter individually by blinking his eyes when his scribe pointed to the correct letter on a display. When the reticular formation was ablated, the animals slept permanently, awakening only to very intense stimuli, if at all, and then returning immediately to "sleep". When the reticular formation was chronically stimulated, the animals remained awake; when the stimulation was discontinued, they returned to their normal sleep-wake cycle. These investigators also described the "desynchronized" EEG as a sign of cortical activation. The parabrachial nucleus appears to play a specific role in maintaining the sleep-wake cycle. The periaqueductal grey appears to be important in the experience of pain and emotion. A core self reflecting "on-line" perceptual awareness, and the distinction between "self" and "non-self". Arguably, many behaving animals have the ability to distinguish between themselves and the environment, and to generate conscious experiences (of pain, for example) from sensory and motor activity. An autobiographical self, consisting of a narrative personal history. It has been argued that only humans have the capacity for episodic memory -- other organisms can learn, but they acquire procedural and semantic knowledge from experience; they do not remember episodes as discrete events with distinct spatiotemporal features. Damasio argues for the existence of an unconscious proto-self, associated with the reticular formation, which monitors the physical condition of the organism. This proto-self is spared even in states, such as coma and the "locked-in" syndrome, where the consciousness associated with the core and autobiographical selves is abolished. It is this proto-self that, presumably, maintains the vegetative functions that are preserved even when consciousness is abolished in coma. However, it is unclear what Damasio's concept adds to the familiar concept of homeostatic regulation, the negative feedback system(s) by which organisms monitor and maintain important physiological parameters (body temperature, fluid levels, nutrients) within the critical ranges necessary to preserve life. And we know that the hypothalamus -- a structure located in the subcortical limbic system, and not generally associated with the reticular activating system -- plays a major role in thermoregulation and perhaps eating as well (drinking appears to be regulated by one or more circumventricular organs embedded in the walls of the cerebral ventricles). In a sense, homeostatic regulation is self-regulation, and self-regulation implies a self -- if only the proto-self of Damasio. The proto-self may be the anlagen, or forerunner, of the more cognitive core and autobiographical selves, which is what Damasio seems to be arguing. But it's also the case that thermostats engage in homeostatic regulation, and nobody (except maybe David Chalmers) argues that thermostats have a self, much less consciousness. Better, I think, to leave homeostatic regulation out of the picture of consciousness -- unless departures from homeostasis are associated with the actual conscious experiences -- qualia -- of warmth, cold, thirst, and hunger. Laborious as it might be, it's clear how to communicate with patients suffering from the locked-in syndrome. In both coma and PVS, but especially in the latter, the possibility has been raised that the patients are aware of their surroundings, even if they are not responsive to them (this was an issue in the Terry Schiavo case). In principle, mental activity of this sort could be assessed by the same sorts of priming techniques employed to document implicit memory and perception in general anesthesia. An experiment by Turkstra (1995) represents a pioneering effort in this direction. Her patients were diagnosed with PVS (patients in acute PVS, for less than 3 months; patients in chronic PVS, for more than 1 year; and patients who had recovered from PVS, as well as controls). 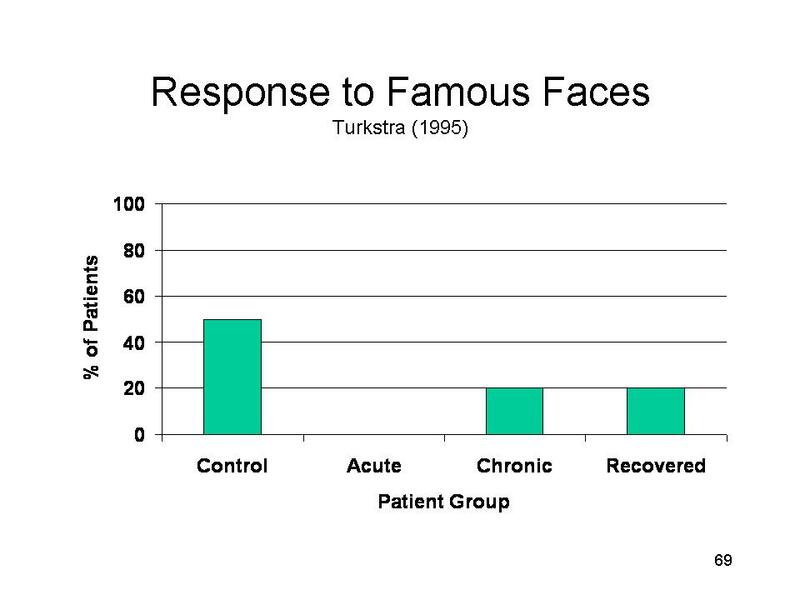 In her experiment, Turkstra recorded physiological responses (galvanic skin potential, a measure of the electrical properties of the skin) to acoustic startle stimuli, orientation and habituation, and response to famous vs. non-famous faces and to intelligible vs. unintelligible written commands. Although some PVS patients -- particularly, those in an acute state -- showed evidence of startle, orientation, and habituation. However, there was no evidence of appropriate response to the faces or commands. 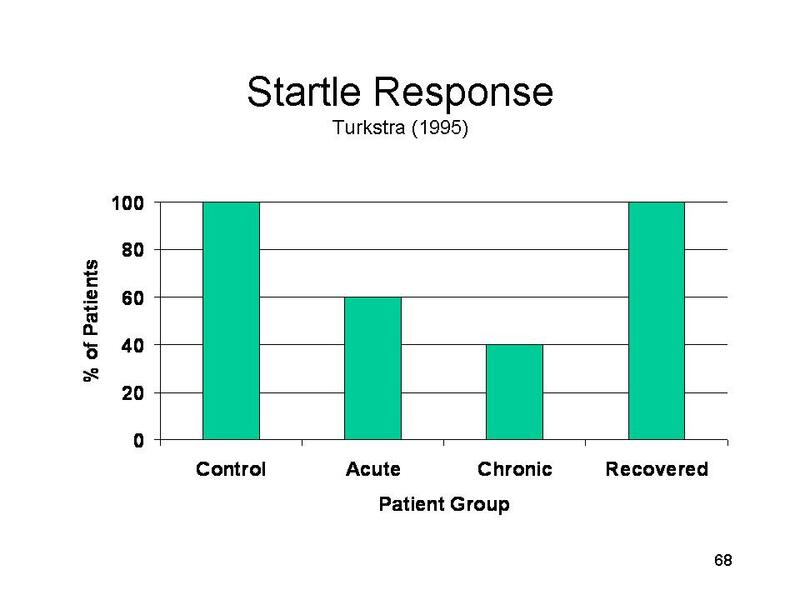 A follow-up study showed that those PVS patients with preserved startle (etc.) were more likely to recover from the PVS (this was true for the acute group, but not the chronic group). Unfortunately, Turkstra did not determine whether these recovered patients had any memory (implicit or explicit) for the original test stimuli. Still, the finding does have some implications for predicting patients' response to rehabilitation efforts. It has also been discovered that some PVS patients can show some degree of learning. Bekinschtein et al. (2009) presented PVS patients with a tone followed by a puff of air to the cornea. The air puff normally elicits a reflexive eyeblink, and after enough trials, neurologically intact patients will show a conditioned eyeblink response to the tone as well. Adequately anesthetized patients do not show the conditioned eyeblink response, but some PVS patients do -- and whether they can learn predicted the extent of their recovery, assessed one year later. Similar studies quickly followed the description of the minimally conscious state by Giacino et al. (2002). As described earlier, MCS is generally diagnosed clinically by observing the patient's behavioral responses to various stimuli. However, various sorts of brain-imaging techniques can be employed to detect mental activity in these patients (and, of course, patients who are comatose or vegetative). For example, Schiff et al. (2005) reported a pioneering brain-imaging study of 2 patients in the minimally conscious state, one of whom also had damage to the left temporal lobe, including the language areas -- which, as we'll see, compromised the experiment somewhat. But in clinical research, you don't always get to pick your patients. 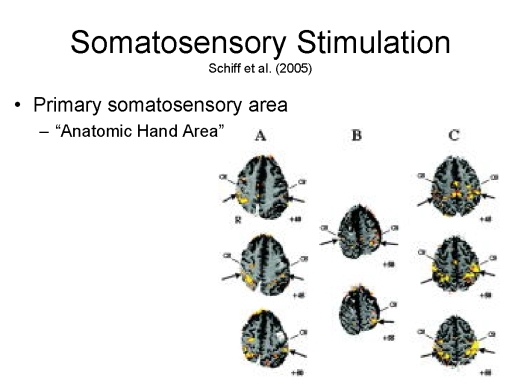 Light tactile stimulation of the patients' hands led to activation in the primary somatosensory cortex, and particularly in the "anatomic hand area". Auditory narratives of familiar events, read in a familiar voice, led to activation of language centers associated with the recognition of speech. These areas were not activated by the same passages presented in reversed speech, and thus devoid of semantic content. Unfortunately, one patient had suffered damage in Wernicke's area, and produced negative results. The other patient, whose language areas were intact, showed significant but "reduced engagement" of language centers by speech. Another study, by Perrin et al. (2006), examined event-related potentials generated in response to auditory stimuli such as the patients' own first names vs. another's first name. Perrin's focus was on patients in MCS, but his study also included patients in the persistent vegetative state and the locked-in syndrome, as well as age-matched, neurologically intact, controls. Perrin's experiment focused on four well-studied "cognitive" components of the ERP: N1, P1, N2, and P3. The results were complex, but let's focus on P3, otherwise known as P300, which generally is responsive to unexpected, or surprising, stimuli. If an experimenter plays a string of high-pitched "beeps" followed by a low-pitched "boop", subjects will show an enhanced P3 wave to the novel, unexpected stimulus. Similarly, subjects will show an enhanced P3 to their own names -- much as in Cherry's study of the cocktail party phenomenon. The control subjects showed a very large P3 response to their own names. Patients in the minimally conscious state or the locked-in syndrome also showed a substantial P3, though somewhat diminished in amplitude. Patients in the persistent vegetative state showed considerably smaller P3 responses. This is pretty much the way the predictions would go, but note that, with respect to some of the other components, PVS patients showed more response than MCS or locked-in patients, or even controls! You can't pick your subjects, and you can't pick your results, either, and these complications warrant further investigation. Returning to P3, however, setting aside the question of the amplitude of P3, let's just look at whether the patients displayed any evidence of P3 at all. Here, the results were more straightforward. Of course, all of the control patients showed a P3. So did all of the locked-in patients -- which makes sense, because there's no question that these patients are conscious. But so did all the MCS patients, which is consistent with the proposition that they are at least minimally conscious. But so did a majority of the PVS patients, which raises the question of whether at least they, too, might be at least minimally conscious. On the other hand, P3 is also ambiguous. Yes, it represents an orienting response to an unexpected stimuli, but such orienting responses can be displayed even by organisms with extremely simple nervous systems -- organisms that we would not ordinarily characterize as conscious. Even in human subjects, P3 can occur in response to subliminal stimulation, of which the subject is unaware. P3 may also reflect an automatic, and thus unconscious, component of speech comprehension. What we really need is unambiguous evidence of conscious mental activity in coma, or PVS, or MCS. One possibility was suggested by a case study by a multinational group of British and Belgian investigators, with a 23-year-old woman who suffered traumatic brain injury following an automobile accident, and who had been diagnosed with PVS (Owen et al., 2006, 2007). She had been unresponsive for five months, though she also displayed the usual sorts of sleep cycles. Using fMRI, Schiff et al. 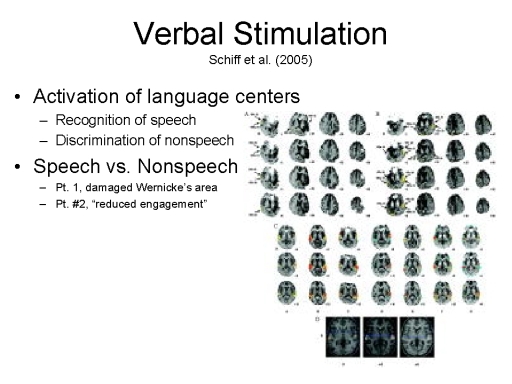 (2002) had shown that she displayed increased activation in her left-hemisphere speech and language centers when presented with speech sounds versus noise, and also with sentences containing ambiguous words (e.g., The creak came from a beam in the ceiling). Again, as with P3, such evidence is equivocal with respect to consciousness. 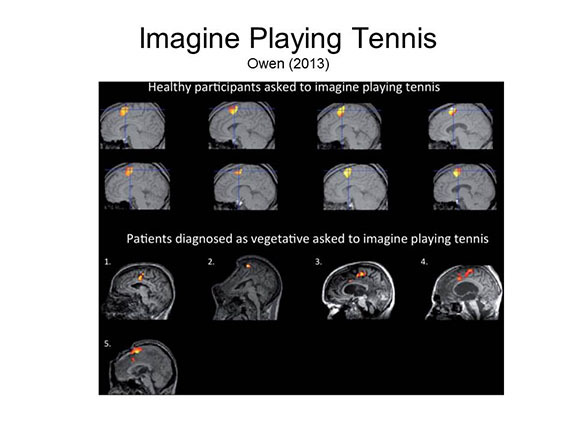 A better test came from a second fMRI study (Owen et al., 2006), in which the patient was instructed to imagine either playing tennis (e.g., swinging a racket) or walking through her house. In response, the patient showed increased activation in the supplementary motor area (where voluntary motor responses are prepared for execution by the primary motor cortex) and the parahippocampal gyrus (an area of the medial temporal lobe known to be involved in spatial processing). This pattern of brain activity, reflecting the cortical processing specific to the understanding and execution of a request for voluntary motor behavior, certainly qualifies as evidence of consciousness -- in both its monitoring and controlling aspects. More recently, this same group of investigators have gone beyond their earlier single-case demonstration experiment study to test a large sample of 54 patients -- 23 with PVS, and 31 in the MCS -- as well as 16 healthy controls (Monti et al., 2010). Of these 54 patients, five showed task-specific differential response to the instructions, activating the supplemental motor cortex during tennis imagery, and the parahippocampal gyrus during spatial imagery. That's a very small minority of these patients -- but it's something. Interestingly, this group of five consisted of 4 PVS patients, and only one MCS patient. One would have thought, and certainly the investigators expected, that the ratio would be the other way around. Here's a detailed comparison of the five responsive patients, following the instruction to imagine playing tennis (Owen, 2013). Patient 5 is the patient studied by Owen et al. (2006, 2007). Patients 1-4 are the 4 PVS patients from Monti et al. (2010). The same areas of the cortex were activated in the patients as in neurologically intact controls. Cruse and his colleagues performed a similar study measuring brain activity with EEG rather than fMRI (Lancet, 2011; Neurology 2012). Three groups of subjects -- 16 PVS patients, 23 MCS patients, and 12 neurologically intact controls -- were asked to imagine squeezing their right hand, or wiggling their left toe, whenever they heard a signal. A statistical algorithm was then used to classify EEG activity in the premotor cortex, focusing on the "hand" and "toe" areas of the motor homunculus; the brain responses of 9/12 controls were decoded successfully. Decoding was similarly successful for 3/16 PVS patients (19%) and 5/23 MCS patients (22%). It is important to note, however, that this index of consciousness was apparent in only a minority of patients -- roughly 20%. Note, however, that in the Cruise et al. studies, roughly the same proportion of PVS and MCS patients responded positively to the commands. But almost by definition, we would expect to see more differential responsiveness in the MCS patients -- precisely because they are supposed to be at least minimally conscious, compared to the PVS patients who are presumably unconscious, and operating on reflexes at best. Another approach to differentiating PVS from MCS relies on the PCI index of consciousness discussed in the lectures on Mind and Body. Recall that Casarotto et al. 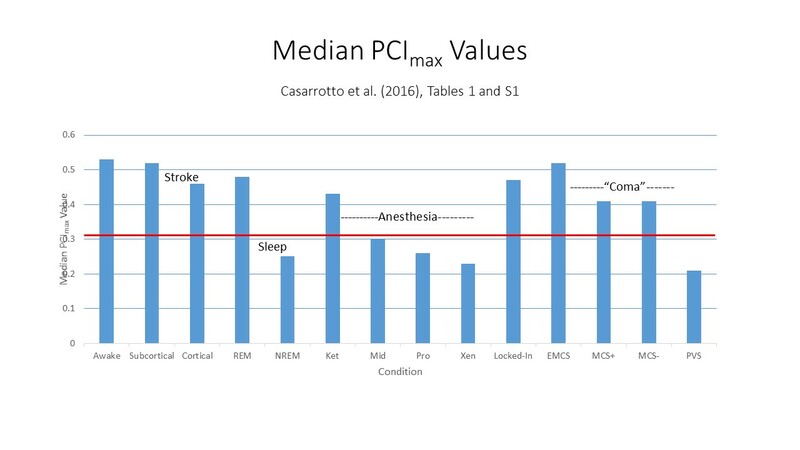 (2016) performed a "benchmarking" study which established a value of PCI* = .31 for distinguishing between subjects who are conscious and those who are not. These investigators also employed this index in a sample of patients with PVS or MCS. The MCS patients were further divided into two groups, MCS+ and MCS-, depending on their scores on the Coma Recovery Scale-Revised (CRS-R); there was also a group of former MCS patients who had "emerged" from their coma. The EMCS patients had median PCImax scores comparable to those of waking subjects with no brain damage, .52 vs. .53. All the MCS+ and MCS- subjects also had PCImax scores exceeding the threshold PCI* value, medians = .41 and .38, respectively. The median score for the PVS patients (.21) did not cross this threshold; however, 9 individual patients (out of 43, or 21%) had PCImax scores that did exceed the threshold. These patients would be candidates for further investigation, and might qualify for a diagnosis of MCS instead of PVS. Based on the finding of differential responsiveness in at least some PVS and MCS patients, and perhaps inspired by Jean-Dominique Baudry, researchers have been interested in investigating the use of EEG and fMRI to establish two-way communication with patients in PVS or MCS. 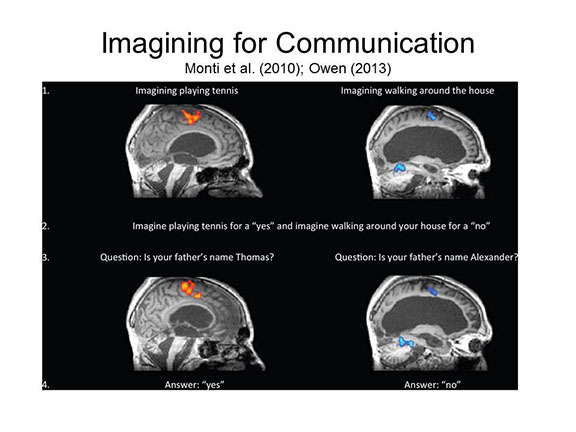 The general idea is to associate specific motor images (e.g., of playing tennis or walking around a house) with particular responses (e.g., yes or no) to questions. In the Monti et al. (2010) study, only one of the five patients (out of a total of 54 patients, remember) was able to answer questions in this manner: 5 out of 5 correct, in fact -- further evidence of conscious awareness and control on the part of this patient, at least. In case there were any doubt, plots of the time course of activation show clearly that this patient responded quickly to each question, activating the "tennis" or the spatial "navigation" task, with the activation dissipating when the patient was instructed to "relax". The case is all the more remarkable, perhaps, for the fact that this patient had been in the PVS for five years when tested. So beyond using brain-imaging techniques to improve the differential diagnosis of PVS and MCS, these same techniques may be useful in establishing communication with these patients. EEG is, of course, much easier to use than fMRI, and considerably cheaper. Perhaps, with this means of establishing communication with patients, it will be easier for families to make "end of life" decisions -- by asking the patients themselves what they want. But before any of these techniques are used to communicate with ostensibly comatose patients, we have to be sure that the signals recorded in the EEG mean what we think they mean. In that respect, Goldfine et al. (Lancet 2012) criticized the methods used by Cruse et al. They subsequently performed a re-analysis of the Cruse et al. (2011) PVS study (Goldfine et al., Lancet 2013). Using what they considered to be a more appropriate statistical algorithm, Goldfine et al. were able to successfully decode the EEG records of only 40% of the intact controls, and none of the PVS patients. They concluded, not that Cruse et al. were wrong, but that one has to be very careful with these methods, given what is at stake. Cruse et al. (2013) replied that their algorithm succeeded in detecting consciousness in 75% of normal controls, whereas the alternative proffered by Goldfine et al. missed almost half of these. So, while the Cruse method may be susceptible to false positives (i.e., detecting consciousness where there is none), the Goldfine method may be equally susceptible to false negatives (i.e., failing to detect is hardly better than no algorithm at all. A remarkable feature of this exchange is that the authors of the Cruse and Goldfine papers are in fact colleagues, such that authors of opposing papers actually work together, and are supported by the same research grant. The jazz pianist and composer Fred Hersch has written an extended multimedia piece, "My Coma Dreams", describing dreams that he experienced during coma that lasted for two months, brought on by a bout of pneumonia. But, as Hersch himself noted, the dreams might have occurred throughout his coma, or during the three minutes -- or, for that matter, three seconds -- before he awakened. The piece premiered in 2011, and was reviewed by Ben Ratliff in the New York Times ("Unconscious Lessons of a Jazzman", 05/10/2011). In addition to communicating with patients in VS MCS (and, thereby, diagnosing MCS in the first place), it may also be possible to spark (sorry) a revival from coma, at least temporarily. Pioneering work by Yamamoto and Katayama (2005) at Nihon University in Japan, and Schiff et al. (2007) at Cornell Medical School, shows that bilateral deep brain stimulation (DBS) of the intralaminar nuclei of the thalamus (ILN) can lead to signs of cortical arousal that were not previously present. 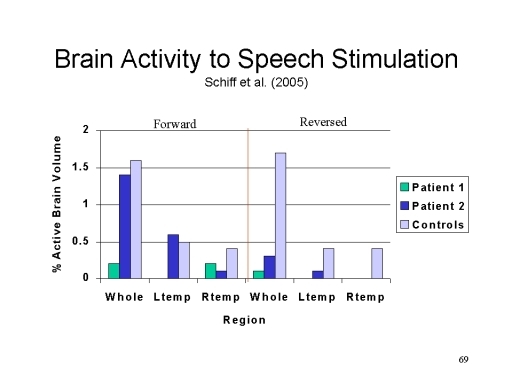 A case study by Schiff (2007) treated one patient to 11 months of DBS, and found that some of the improved functioning persisted even after DBS was terminated. It's important to understand that none of these patients returned to full functioning. Neither of these studies attempted to use DBS to shift comatose patients into VS, or MCS -- though that, of course, remains a possibility. Still, the success of these early studies sheds light on the neural correlates of consciousness. We know that activation in the reticular formation passes through the thalamus to reach higher cortical centers. Damage to either the reticular formation or the thalamus causes coma. Perhaps these patients sustained damage to the RF, so that this activation was shut off at the beginning. In such a case, external stimulation of the thalamus should restore some degree of conscious functioning, as it apparently does. If the damage had been to the thalamus, preventing activation arising from the reticular formation from reaching higher cortical centers, it is not clear that DBS of the thalamus would have had the same effect. In any event, DBS underscores the role of the pathway from the reticular formation, through the thalamus, to the cerebral cortex in maintaining wakefulness. For a popular account of the discovery of the Minimally Conscious State, and an exploration of the practical and ethical issues surrounding it, see Into the Gray Zone: A Neuroscientist Explores the Border Between Life and Death by Adrian Owen (2017). So, with respect to the persistent vegetative state and the minimally conscious state, there is some evidence for conscious, intentional activity in these conditions, for some, but by no means for all, patients -- indeed, only a small minority of these patients show any evidence of conscious awareness. Studies using fMRI and other brain-imaging may well lead to the development of more refined diagnostic tools. For example, based on the extensive study of Monti et al. (2010), we would tend to doubt the clinical criteria for MCS. By any standard, more MCS than PVS patients should have shown evidence of conscious activity. On the other hand, their imagery task may well prove decisive in assessing consciousness in these patients, and in determining who, among PVS patients, really are at least "minimally conscious". 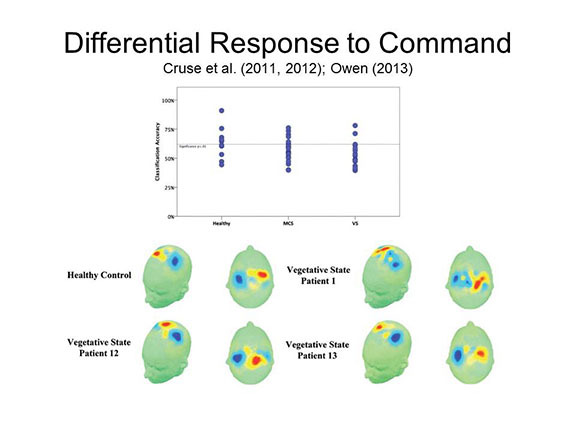 Based on the evidence from Monti et al., it seems doubtful that the imagery technique can serve as a means of communicating with "true" MCS patients. But it's something that is worth trying in patients who show at least minimal evidence of consciousness. When it works, the technique may prove useful for medical decision-making -- for example, consulting the patient about various medical decisions such as limitations on treatment or maintenance of life supports. But once a patient has become comatose, or entered the persistent vegetative state, the responsibility for making these most difficult decisions will fall on the patient's family. All the more reason, I think, for everyone to give these conditions serious consideration, and consulting with family and physicians to create advance directives for medical decision-making. Terry Schiavo's husband said that she wouldn't have wanted to live in the persistent vegetative state; her parents thought otherwise, and in the subsequent court battle she became a political football. Everything would have gone differently had Ms. Schiavo made her intentions clear before she fell ill. This page last revised 02/24/2018.